The Shanghai Ing Foundation has opened its first International Collegiate GO Tournament to US and Canadian college students, according to Michael Fodera of the American Collegiate Go Association. Students who attend the July 7-13 event will play go with players from all over China and the world, travel around Shanghai and Hangzhou and play teaching games with stars Gu Li 9P and Chang Hao 9P. While players must cover their own travel costs to China, their food, accommodation, travel within China, tour costs and sponsored events will be paid for by the Shanghai Ing Foundation. “I was one of the players that attended the [Ing-sponsored] 2011 go summer camp,” Fodera tells the E-Journal, “ and I can honestly say that this is a chance of a lifetime. The Ing Foundation really does not spare any expense when it comes to these events.” The opportunity is open to players who have attended college or will attend college — undergraduate or graduate — in the 2013 calendar year, and who do not hold a professional certification from a recognized go association. Act fast, however. The deadline for registration is May 15, and, while there is currently no cap on the number of North American students who can attend, the event includes students from the rest of the world as well and if room runs out, requests will be handled on a first-come first-served basis, Fodera says. Click here for details of the trip, as well as links to the registration form and schedule. Questions may be addressed to Fodera at mdf116@brandeis.edu or to the Shanghai Ing Foundation’s Min Xiao at min_xiao@harvard.edu. 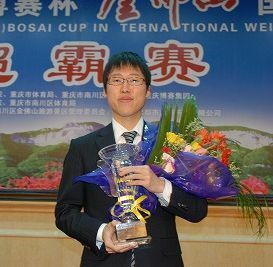 After several months of preliminaries and finals, the 16th Samsung Cup wrapped up surprisingly quickly this week, with a three game match between Won Seongjin 9P and Gu Li 9P. The games were played over three consecutive days starting on December 5, 2011. Won clinched the third game on December 7, scoring a 2-1 win, as well as his first major international title. Both players are renowned for their thick and powerful fighting styles, but many go fans expected Gu, who’s known as ‘muscle man’ in Asia, to defeat ‘Won punch‘ in the heavyweight stakes. Even if Gu’s fans were disappointed with the results, they can’t have been disappointed with the games, which thoroughly demonstrated the power and creativity of both masters. - Jingning; Games and photos are available in her original article: Won Seongjin wins 16th Samsung Cup! 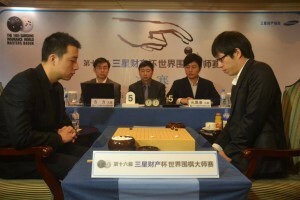 Photo: Gu Li 9P (left) and Won Seongjin 9P play the opening of the second game. The finals of the 3rd BC Card Cup started this week, with Lee Sedol 9P of Korea facing off against Gu Li 9P of China. Lee is the defending champion, and qualified for the finals by beating up-and-coming countryman Park Junghwan 9P. Meanwhile, Gu defeated Heo Yeongho 8P to challenge Lee in the final. The first two matches were played on April 23-24 and the score is currently tied at one game apiece, with Lee evening the score in the second game. This leaves many go fans waiting in suspense to see how the match continues, with the head-to-head record between these two players deadlocked at 12-12. Even the readers at Go Game Guru are evenly divided over who will win the final, with a poll about the outcome split at 50/50 at press-time. Lee Sedol was in high spirits at the pre-final press conference and banquet in Seoul, admitting to the media that he was no match for Gu when it came to drinking. After Game Two, Lee said that he was lucky to win, after an unsatisfactory opening and that Gu must have made a miscalculation in the middle game. The next game will be on April 26. - Jingning; based on her report 3rd BC Card Cup: One win apiece in the final at Go Game Guru, which includes the game records.